* The Papain powder used in this product complies with the standard set by the British Pharmaceutical Codex 1954. The Calcium phosphate is an essential ingredient and provides the necessary alkaline medium (ph. 7.4) to ensure proper enzyme and Papain assimilation in the stomach. Dicalcium phosphate, Papain powder, Hypromellose. Take 1 - 2 capsules swallowed with water twice a day. 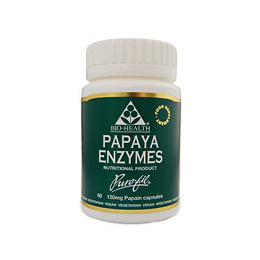 Below are reviews of Papaya Enzymes - 60 x 120mg Vegicaps by bodykind customers. If you have tried this product we'd love to hear what you think so please leave a review. Very pleased with the product. I buy these regularly as I think they are the best on the market. Thank you. Papaya is native to Central America, southern Mexico and every tropical and sub-tropical country. Papaya Enzymes can be taken during meals to aid digestion.